New-car registrations rose in Germany, France and Spain in October, fueling hopes of a sustained recovery in the region's market even though Italian vehicle sales were down. Registrations in Germany increased by 2 percent to 265,441 vehicles compared with the same month in 2012. In France, registrations were up nearly 3 percent to 166,515 cars. Government subsidies helped to boost Spanish sales by 34 percent to 60,301 units in October, while sales in Italy fell by just over 5 percent to 110,841 vehicles. In Germany, Volkswagen brand, the market leader, registered a monthly gain of nearly 2 percent. There were strong gains for Skoda (37 percent), Porsche (24 percent) and Opel (12 percent). Download PDFs for Germany and France registrations by brand and automaker for October and 10 months. The October gain shows that the German market is stabilizing as private buyers become more optimistic about the economy, said Volker Lange, president of the VDIK car importers association. German sales for the first 10 months fell 5 percent to 2.48 million. In France, new models such as the Renault Captur and Peugeot 2008 subcompact crossovers and new Peugeot 308 helped domestic automakers PSA/Peugeot-Citroen and Renault reclaim some lost ground from foreign rivals. Peugeot brand sales rose by 11 percent last month, offsetting a 3.5 percent decline at Citroen. Renault group sales rose 5.8 percent, with Dacia sales up nearly 10 percent and Renault brand posting 5 percent volume increase. "This is a strong showing by the French carmakers in a positive market,"said Francois Roudier, spokesman for the CCFA industry association. Volkswagen's group sales fell by nearly 4 percent as all VW brands including Audi, Skoda, Seat and the core VW marque suffered falling volumes. Hyundai and affiliate Kia posted a combined 5.8 percent increase in French sales, with Toyota not far behind at 5.2 percent. General Motors sales jumped 9 percent thanks to a 31 percent surge by its Chevrolet brand and a 2 percent rise in Opel sales. The CCFA improved its French market outlook, predicting a 6 percent decline for 2013 - smaller than the 8 percent contraction previously forecast. "The market is picking up," said Renault's French sales chief Bernard Cambier, adding that the carmaker's domestic order backlog was up 20 percent year-on-year. "It's clear that we have reached the bottom and there are already some signs of recovery," Cambier said, citing a 3.7 percent gain in delivery van sales in October. 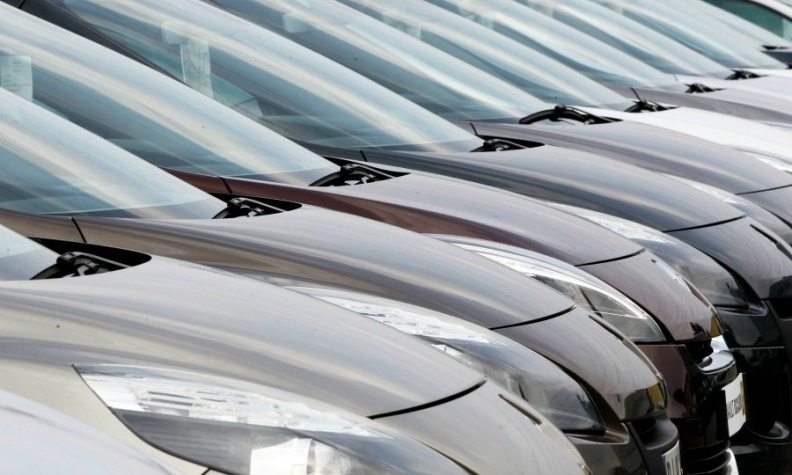 French car sales are down 7 percent to 1.48 million for the first 10 months. Car sales in Spain were boosted by a 2,000-euro rebate program - 1,000 coming from the government and 1,000 from the manufacturer - for buyers of new cars who turn in a used car. Spanish car manufacturers' association Anfac said internal demand in Spain remains low but the subsidy program had revitalized a lackluster market. Company car registrations rose in October for the first time after 20 months of falls, up 7.6 percent, to 18,728 cars. Across all sectors, more than 715,000 new registrations would be completed this year, Anfac forecast. "We're optimistic not just about the rest of the year but also about a clear improvement in business in 2014," said Jaume Roura, head of car dealers association Faconauto. October's decline in Italy showed that there is no sign that the country's market may be stabilizing. A weak economy and tight credit conditions are keeping buyers out of showrooms. Fiat's Italian market share was 28.12 percent in October, slightly below the 29.08 percent in October 2012, according to calculations made by Reuters.